The following text is one of the last songs that Jeremy ever penned, the summer of 2011. On this day, the fifth anniversary of Jeremy’s home going, I thought I’d at least share the text. I know the messiness and the hopeful beauty of the canvas of my life and the lives of my boys, as well as having known Jeremy’s life so intimately. We are sinners and saints. I’m both undone and upheld by the truth that there is a loving God who has promised good and life to us, and offers comfort for us in the midst of our brokenness. We cannot always see what He is doing or what He sees, but as Jeremy taught and modeled to us well, we can trust that He knows what He’s doing. Backtrack with me a few months to Christmas (2013). We’re in Roseau, celebrating with family. I always make it a point to visit Jeremy’s grave when we’re there, snowstorms and all. Though it was a snowy and cold week and the cemetery road wasn’t plowed, I was still determined to make the trip over. With his grave being so far north we have few opportunities to visit, so it matters to get there when we can. I still haven’t quite figured out what to make of my times by his graveside but I often take a moment to remember, a moment to be grateful, a moment to grieve and a moment to renew my trust in a God who is sovereign and good and very, very present. All that, wrapped up into a simple prayer, is what goes on by the graveside. So Aedan and I were on our way to a friend’s house to visit. I purposely took a longer detoured way so I could stop by the cemetery. I parked the car and asked Aedan if he wanted to venture out with me. He responded, “No, I’ll stay here.” Okay, that’s fine. I’ll be right back. So in my snow pants and Sorels, I trudged through knee-deep snow to Jeremy’s grave. When I finally reached the headstone, I realized I wasn’t alone. Aedan, having changed his mind, was not far behind me bounding though the snow to join me. We spent our few moments and then made a mad-dash for the car, racing to see which one of us could most quickly outrun the other through such deep snow, without falling on our faces. (I’m pretty sure I beat him. He may not agree. But neither of us fell on our faces). This race, on my part, was mostly an effort to curb the sadness for him. To make our hearts glad, I thought. But once buckled in I turned and looked at Aedan whose eyes were filled to the brim with tears. And I gulp. I really do. These are hard questions coming from a ten year old. I have answers to them, but with years of faith underlying the facts. His faith foundation is being made right now. And it is these moments when my heart gets angry. Jeremy should be here. He could do this better than me. He could answer these questions and help lead Aedan out of his sorrow and fear. I know those thoughts are not from God, but sent by the one who would lead us to despair, to cripple our faith. It is in that moment (and many other moments), that that voice is so loud. So I told him what Scripture tells us, what we know to be true…and I could tell it wasn’t enough. Not that day, anyway. He had heard it all before. And my heart grew more frustrated, more helpless. He was needing more to satisfy his grief and his fears and I was feeling so incapable of offering anything. So I repeated something I tell him often. Tell God, Aedan. Ask Him your questions. Ask Him to show you that He’s real, that heaven is real, that He really is good. Press into Him. I don’t know what Aedan thinks when I tell him those words but I hope they are words that come to his mind for the rest of his life. I looked up at Aedan, his blue eyes big and wide, filled to the brim with new tears. “Yes, yes…” he said, nodding his head repetitively. My son had tasted hope. I told him, Aedan, dad’s life here was just the beginning. And his greatest days, your greatest moments with him…they will never be erased or forgotten. You, your brothers and I will forever remain on the title page of dad’s story and he will forever remain on ours. What Jeremy is experiencing now is more real than the life he lived with us, but the life we shared with him still matters greatly, for all of us. And so the lies and fears were overcome with hope, if only for the moment. And the boy who couldn’t get the image out of his mind of a broken body buried under frozen ground had that image replaced by a perspective and hope that can hardly even begin to grasp the weight of such glory. That’s what truth does to lies. The Chronicles of Narnia were a childhood favorite of Jeremy’s. I had tried to read them years ago but couldn’t get into them. I’ve been reading them aloud to the boys at night since Christmastime and we’re all captivated. And after each chapter is read, I play the boys Jeremy’s Fledge* as I turn out the lights. And they say, “will you play it again, Mom?”. We’re nineteen months past Jeremy’s death and the boys are finally asking to hear his voice. Not once, but twice. *”Fledge” is a cabby’s horse (called Strawberry) who enters Narnia and is given wings and a new name. I remember just days after Jeremy’s death, as funeral plans were in the making, I sat at the table with a good friend pondering what it meant to be a widow. Who am I to be without him? I knew nothing about this role, this act, this loss, but I felt the severing that had happened. Although our vows had been kept they were now as fulfilled as they ever would be and no longer necessary. I was no longer his, no matter how badly I wanted to be. It had also become obvious to me that in America we have so little custom or traditions to help us walk a road like this one with grace. In some cultures widowhood is spelled out for you–the wearing of black, the remaining behind closed doors with family for an allotted amount of time to lament and a future that may have already been decided. That’s not the case here. Although I have been grateful for the freedom to grieve and live life in a way that resonates best with who I am and what God has been doing in me, there have been many moments when I’ve just wanted some tradition to fall into. Somebody please tell me what to do, who to be, how to grieve and how to live. Traditions and customs can, at times, help us to remember and sink into who we are, where we’ve been or who we’ve become. Wedding rings can also serve that purpose. I know some people who have prided themselves in never having once taken their ring off their finger. I know others who wear theirs faithfully, maybe removing it every so often to cook, work or wash hands. Then there are others who have lost their rings and failed to replace them. This doesn’t necessarily mean that their love for one another is any less, for the covenant of marriage must reside fully within the heart. The ring only serves as a reminder (which we do need at times) because just the wearing of the ring does not keep the covenant. There are many who wear the ring but hold little to the covenant it stands for. For Jeremy and me, our rings mattered to us. They reminded us of whose we were, of the vows we had made to the Lord and to one another. They were an acknowledgement to the world that we were in covenant with someone and that this was to be respected and honored. About five weeks in to Jeremy’s seven week hospital stay we took off his wedding band due to fluid buildup in his hands while on the ventilator. I wore it on my thumb for the remainder of Jeremy’s time in the hospital, anticipating the day when I would place it back on his finger. But a few weeks later I sat in a chair beside an empty hole. 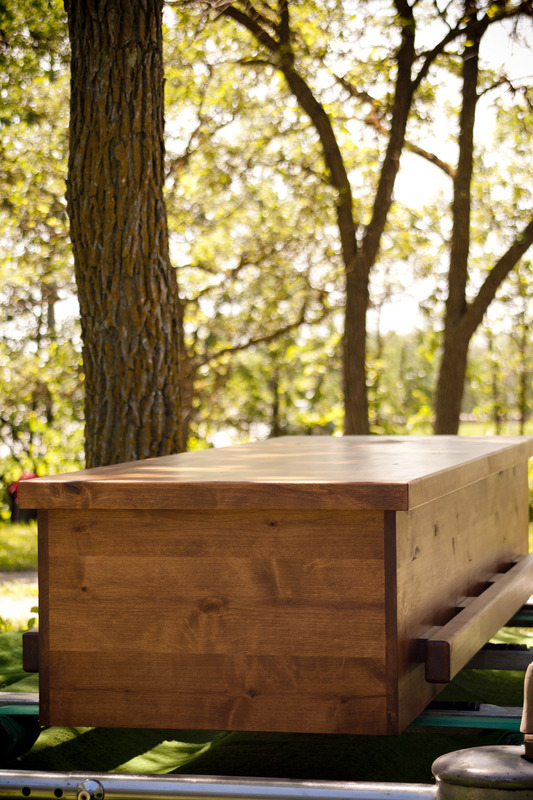 The graveside service was over, his casket still sat above the ground and I wept. Must this really be how it all ends? We did it right. I gave everything I had to be fully his…and here I am without him, much too early. Six months before, on January 5, 2012, Jeremy and I had celebrated our 10th wedding anniversary. The gift that I opened that morning was another ring. I found Jeremy down on one knee in front of me, our boys gleefully watching, and he spoke words about his gift and his love for me. The ring was nothing special by sight. It had no diamond. It was a simple three banded rolling ring, sterling silver, and worth very little. But Jeremy infused it with meaning, saying there were at least three themes he could think of, maybe more–a cord of three strands cannot easily be broken, a band for each of our three boys and a representation of the Trinity (Father, Son and Holy Spirit). He placed it on my right hand ring finger where it fit best at the time, while we admired my wedding ring on my left, which continued to serve as a remembrance of our covenant with one another. 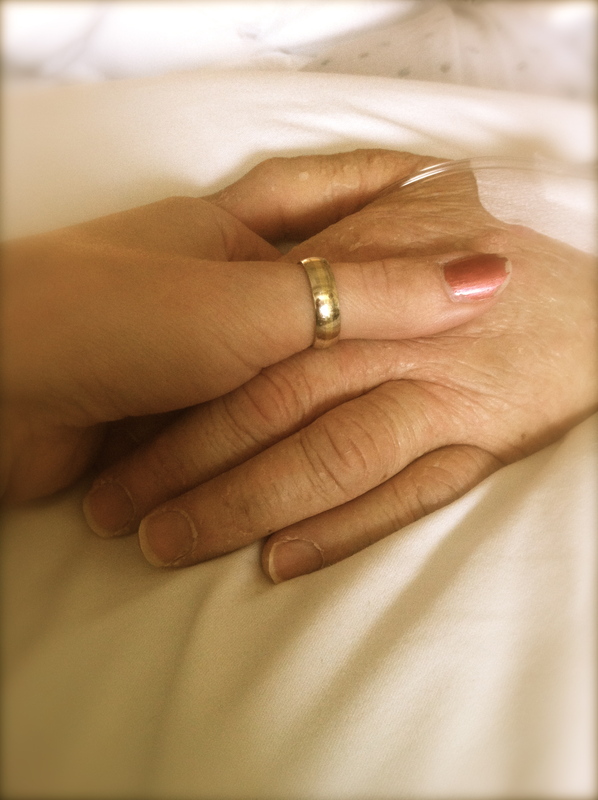 Months later, as I sat at his grave feeling the weight of his death, I removed both rings from my fingers and swapped their places–my wedding ring to my right hand, the anniversary ring on my left. I knew in that moment that the ring Jeremy had given me on our anniversary was to serve a much greater purpose than I had ever imagined. In a culture that lacks a common tradition of grief there is no easy answer for what to do with your ring when you are widowed–when to remove it, how long to wear it. But this was one decision that had already been made. Three of my best friends sat with me during these dark moments by the graveside while others mingled off. One kindly whispered, “Jen, you know you don’t have to do that. You don’t have to take your ring off.” I know I don’t have to. But I need to. There are times in life when our outward actions have to precede our heart’s desires, our resolutions or our acceptance of things. My heart was still his but clearly our marriage was no longer. However, if not for that second ring, I don’t know if I would have-or could have-made the switch. I don’t know if Jeremy ever pictured me actually sitting beside his grave grieving the loss of our marriage. But I know he had thought through the implications of what this would mean for me and he was kind enough to bear some of those weighty thoughts alone. I don’t know if he knew how grateful I would be for that anniversary ring. The ring that was now worn on my left hand still tied me to Jeremy–it was his gift to me. Yet it bonded me so much more to Christ, to the boys and to the truth that marriage is a foreshadowing of something much greater and grander than we’ll ever know here. This, here, was the taste. There is still more to come. I am sheltered by Jeremy’s love because of his foresight. I have not always been able to keep the ring on my left hand. Within the first several months after Jeremy’s death I found I was often moving it back to my right hand and wearing it underneath my wedding ring because it kept slipping off my left and I didn’t want to lose it. But it has mattered greatly to have it. And though it was a harsh, painful and immediate severing of our marriage when Jeremy died, God spoke kindness through it all (maybe even intention?) in letting me walk into widowhood gently and slowly in other ways. What our imperfect marriage foreshadowed is a truth and greater reality that is still mine to behold one day. Jeremy is nearer to it now but one day I will be, too. One day we will again be feasting together. It won’t be marriage like we knew it here but I also think it won’t be less than marriage either, but more. We will be together, united with Christ. Until then, as has always been, I am not without God’s love. I am bound to Him and His ways and to the boys, and I will continue to be the recipient of His love and graces until He welcomes us home. When I struggle with how to walk this road gracefully I realize that tradition or customs wouldn’t necessarily be of greater benefit to me. When I crave the guidance of what to do, who to be, how to grieve and how to live, God provides those answers. Who I am without Jeremy is of much less concern than of who I would be without Christ. He is doing more in me and in the world than we’ll ever know or understand until we find ourselves feasting with Him on that glorious day. There is so much more. “This is not the end here at this grave, this is just a hole that someone made. Every hole was made to fill and every heart can feel it still–our nature hates a vacuum. This is not the hardest part of all, this is just the seed that has to fall. All our lives we till the ground until we lay our sorrows down and watch the sky for rain.